tee hee. mrwwwr. orr Cat and Critters People ratherr, there are cat mens out there, yes? wowwrr, she's purtty! and furrry! aww, i want furr on my cookie and peaches, too. I see Melody and Micah for A3/H3 are onsale once again at RDNA... but I have always been confused about these products and the addons (The Furries?)... What products do I need for cat women and beyond? Does anyone here recommend? There are some bundles too... Would love to get them furred in Carrara but not sure where to start... I guess I'd like to get the whole gang... What bundles should I grab that don't duplicate...? You need Melody & the RTE (Free) mentioned above. Another option is CDI's Kioki Furry (despite the name it works on stock Aiko3). It is a set of dials to give Aiko a furry face that is closer to human. I used to have poses for an actual cat face but can't find a link. You will need to get a separate texture but any A3,V3,M3 will work. Love all the images. Thought I'd post a couple of my cat people pics. They are actually filtered Furries promos. To answer holly, Melody and Micah are essentially A3 and H3 with a new head and tail added, so they can wear A3 and H3 clothes. As has already been mentioned, you need RTEncoder to decode them, since the original body mesh belongs to DAZ. Furries for Melody, Furries for Micah and Furries Bundle (includes both Furries for Melody and Furries for Micah) include morphs and face and tail shaping poses for Melody and/or Micah. No textures come with them. The Melody version requires RTEncoder to decode. The Micah version uses PMD injection, and does not require RTEncoder. Furries' Furs are texture sets, and usually include some new face presets (requiring Furries for Melody, Furries for Micah or Furries Bundle), as well. 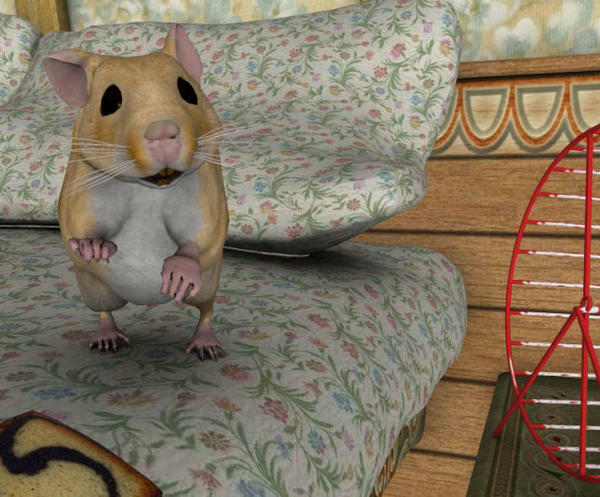 However, Furries' Furs Chihuahua does not include face presets since it is a Real Deal. The extra faces to go with the chihuahua, as well as a set of horse/donkey faces are separate Real Deals. Then there is the Furries' Deer set that has deer face presets, a deer collar, deer antlers, and textures for the collar and antlers. The texture used on the deer is not included, but is part of the Furries' Furs - Skunk and Squirrel set. If you were to purchase something, you'd definitely need Melody and/or Micah for the base model. To get other animal shapes, you will need Furries for Melody, Furries for Micah, or Furries Bundle. For textures, you will need some of the Furries' Furs sets. is Aiko haz a lil fluffy tale envy? Is this the morph you tried to find? Which creates something like the attached image? That's it. I had the pose but couldn't tell the OP where to get it. That's a great package but not specifically a furry oriented product. This is all entirely separate from Peaches. The Fur Ruff in the Critters package responds very well to Crossdresser. Bast beseeches her fellow gods. Thought I'd give this ol' thread a lil' "kick in the pants". Redfern, you are currently my favorite person in the whole universe. Actually, what sells the look probably better than the morph is the texture set Beth Capsces made. 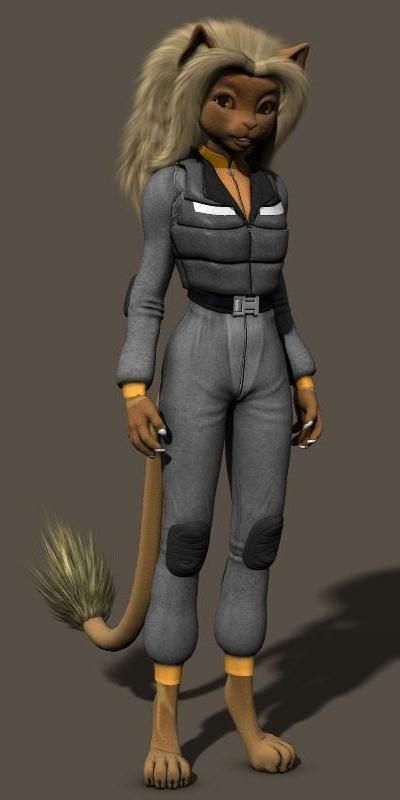 Originally sold at Poser Pros and has not been available since that store closed, Capsces created "feline" textures that could be applied to Victoria 3, Michael, shoot, all of the Millenium 3 figures since they all shared the same mapping. She labeled it "Felis Sapiens" and the base pattern along with its variations were derived from photographs she snapped of her favorite cat, Mimi. 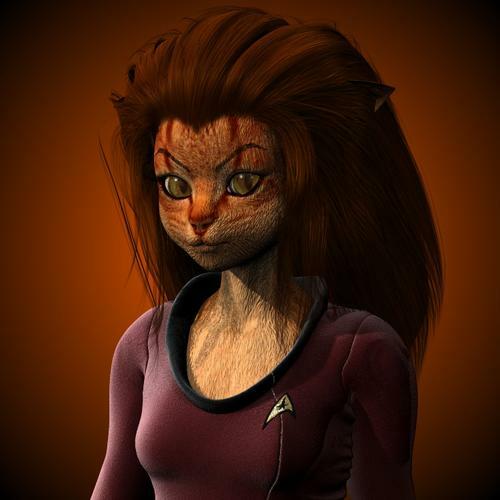 I used red/orange version for my depiction of Lt. M'Ress. Beth later modified the set to fit upon Melody (and Micah), repositioning and reshaping the head textures so they would align with Melody's facial features. That set is still available, but the head patterns won't align properly upon Aiko 3's face (or any other Mil' 3 figure). D'OH! You are, of course, correct! I'm fretting over relatives arriving this weekend (I'm pretty much a "hermit" under most circumstances) and the distraction is scrambling my thoughts (moreso than usual). Still, the idea is still valid. The textures make my modest preset (based upon your morphs, Beth) look considerably better. I know how that is, Bill. I enjoy the seclusion of my little patch of woods and fret any time visitors come. It looks like it wouldn't be too hard to convert the Melody head tex back to A3 head. MaPPer, a customer and occasional poster in these forums did pecisely that for a particular project. Now that all of the Melody & Micah products are once again available, I wanted to show what can done with them. 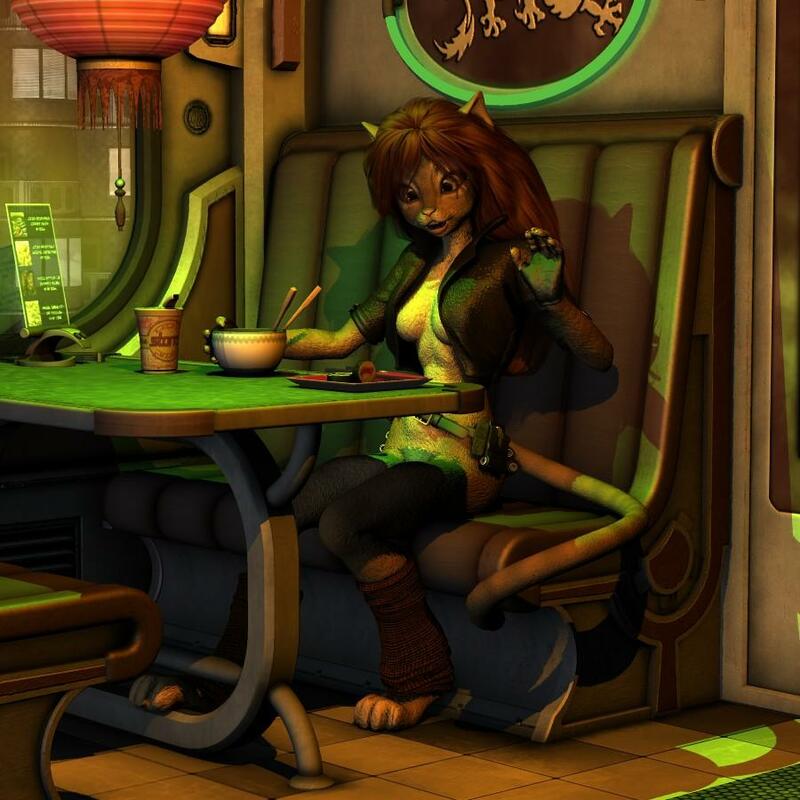 As you can see from my avatar, I'm fascinated with cat people (that's me wearing prosthetic makeup I sculpted and cast), and I've drawn catgirls (the furred "kemono" variety as opposed the the nearly human "neko-chan") since 1985. Since delving into digital graphics, I've continually experimented with different figures trying to recreate two different characters in polygonal form. LittleFox's "Melody" enhanced by Beth Capsces morphs has allowed me to get closer to my illustrated designs than any other figure. Here's "K'Tharr Rauthimas" (whom I presented earlier in this thread sitting within a diner), an "ailuromorph" who developed from those first "funny animal" drawings I doodled in March of '85. You can compare the Melody version with the inserted pen and colored pencil drawing I drew in the latter 90s. I'll leave it to you to determine how close I caught the original 2D concept. And here's "Lt. Ahtahbi Mzzkiti" from "Freighter Tails", a web-comic I drew from 2001 and then allowed to languish after my writing partner, Paul Scott Gibbs died in 2002. Yeah, I used similar morphs for her face, but that's logical as I used K'th as a "template" for Mzzkiti and simply drew her a tad more cartoonish style. True, Melody might not serve everyone's needs for all "anthro" characters, but fdor me, she proved the near perfect solution for translating two beloved personal concepts into a new medium. Is this one of the renders that uses the Versa-tail as hair/mane? Yes, you are correct. Three copies, one for the main "mass" atop her scalp and trailing down the back, and two more scaled smaller to form the, uh, I'm not sure what one might call them, "forelocks", maybe? It's a shame JENelson (aka Achronicity at FurAffinity and other sites) closed his "store" as it meant the loss of the 'Versa-Tail" and "Kasa for A3", the latter giving A3 and Melody digitigrade feet. In theory, Little Dragon's free "Bushy Tail 2" (which is still available) could be used similarly as "Versa-Tail" expanded upon the approach LD used. I tried the Hypertail a while ago but never got it quite right.